Welcome to the new OC! Existing since 1956, Oshawa Centre was an unenclosed shopping centre and included only 28 stores in its directory. Its original structure focused on an outdoor shopping experience and was only a sixth of the size that it is today. This 10 million dollar project was coined “Canada’s most beautiful shopping centre” and housed the formerly popular Eaton’s of Canada as its major anchor store. Throughout its existence Oshawa Centre has transformed, undergoing major renovation to a completely indoor mall complex in 1968, renovated in 1994 and redesigned the south end in 2009 to include H&M, Sport Chek, and Shoppers Drug Mart. In order to improve the shopping experience for our customers, we entered our first redevelopment phase in the spring of 2013. The $230 million expansion and renovation opened on September 29, 2016, and our shoppers will find that there is more to love with up to 60 new retail stores, two full service restaurants, a brand new 1000 seat food court. Entrances have been updated throughout the property, new ceiling treatments, lighting and tiling were also updated. A new underground parking garage on east side with an additional 250 spaces was also opened with access to the food court and direct access to Goodlife Fitness. The second phase of construction started in January 2017 with an additional 60,000 sq. ft. of redeveloped space including the old food court area and a new wave of stores including Zara and Browns. Since 1956 Oshawa Centre has grown into a 1,219,962 square foot super-regional shopping centre serving as Durham’s fashion, service, and entertainment hub. With a growing retail mix now up to 260 stores, Oshawa Centre is a one-stop-shopping experience where you can find both affordable and trendy fashion options. For over 55 years, Oshawa Centre has been the hub of the community and has represented a place for shoppers to explore. As Durham region grows, so too does the OC’s customer base. 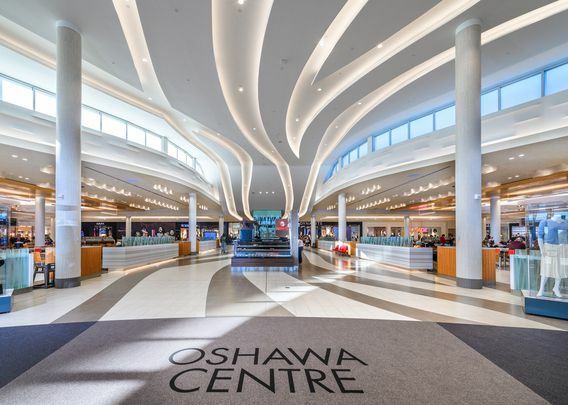 Oshawa Centre strives to connect with both loyal and new customers on a personal level, while providing an unmatched shopping experience with approachable yet fashion-forward retailers and ongoing community engagement. It was so nice to meet you, we hope you visit us soon!